Few musicians have had as lasting an impact on music as Joni Mitchell. In her four-decade career, she made groundbreaking music that traversed genres and continually stunned fans and critics alike. 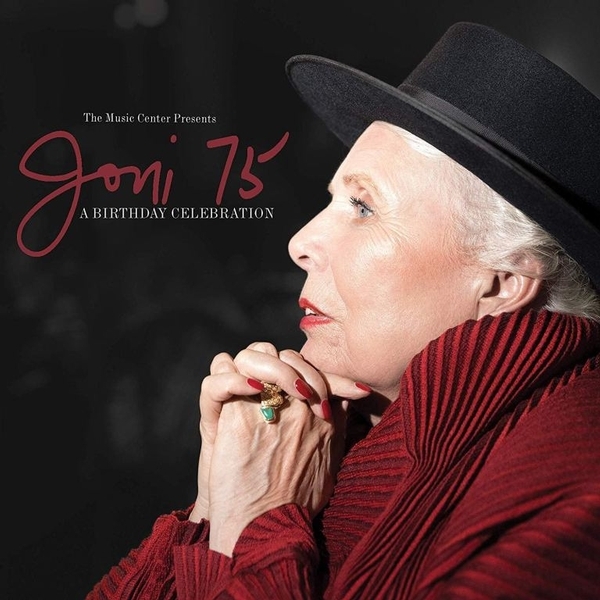 The music icon celebrated her 75th birthday in style last November, as Jörn Weisbrodt and The Music Center in Los Angeles hosted a pair of star-studded Joni 75: A Birthday Celebration concerts in her honor. The line-up (which Joni helped select) featured many of her closest friends and dearest collaborators, including Graham Nash, Seal, Chaka Khan, Kris Kristofferson, and James Taylor. Also on the bill were Diana Krall, Brandi Carlile, Rufus Wainwright, Emmylou Harris, Glen Hansard, Norah Jones, and Los Lobos with La Marisoul, Cesar Castro & Xochi Flores. Featuring a set of Joni classics and deep cuts from across her career, each night was a thrilling tribute full of excellent music. November 7 was even more magnificent, as Mitchell herself attended and even appeared onstage to blow out birthday candles and sing along as the all-star band and more than 3,000 fans sang "Happy Birthday" and "Big Yellow Taxi" in tribute to her. Last night, fans across North America converged for a special, one-night-only screening of Joni 75: A Birthday Celebration, a two-hour, Martyn Atkins-directed film that featured footage of a majority of the concert (captured over two nights), along with special behind-the-scenes interviews with the artists. For more about the film, check out Sam's review on Joni Mitchell's official website. In March, fans will be able to relive the memorable night as the Joni 75: A Birthday Celebration continues with a soundtrack of highlights, a DVD release, and a screening on U.S. public television network PBS. We were able to secure a copy of the soundtrack, so enjoy this expanded look at the album! A CD of highlights from the concert - also entitled Joni 75: A Birthday Celebration - will be available on March 8 from Decca. The album's 16 tracks include some of the best selections from the stellar performances seen in the film. It kicks off with a rollicking "Dreamland," performed by Los Lobos with La Marisoul, Cesar Castro & Xochi Flores. Their arrangement recasts the song and a buoyant son jarocho style workout that is positively joyous. The already soaring track is made even more special with the inclusion of Chaka Khan, who shines in her guest vocal spot, just as she did on Joni's original recording in 1977. Next up, Chaka Khan takes on Mitchell's biggest hit, "Help Me." She transforms it into a sultry soul track, complete with backing vocals from Rufus Wainwright and Seal. Diana Krall's "Amelia" strips the song down to piano and upright bass in an expressive rendering. The subtle and surprising arrangement is as dynamic as it is chilling, highlighting the strange solitude the underscores Joni Mitchell's original. Meanwhile, Rufus Wainwright performs a dramatic "Blue" along with a lively and brassy "All I Want," while Irish singer-songwriter Glen Hansard takes on "Coyote." As is the case with so many of her songs, Joni's original "Coyote" is a perfect marriage of words and music, with phrasing so exact and emotionally cutting that any performer seeking to do it justice may well be left out of breath. Hansard is no slouch, though, as he tackles the beast with passion and precision before shifting into an intriguing and spooky concluding jam with the house band. The emotional high of the album may be Seal's take on "Both Sides Now." Written when Joni was just 23, it's in some ways a song about everything. The song has had quite a life: there's Judy Collins' lilting, harpsichord-heavy hit version; Joni's original acoustic guitar-led version; and, according to Joni's official website, about 1,200 other versions. Seal's performance takes inspiration from Joni's orchestral version from 2000, with and presents the classic with masterful phrasing and gripping emotion. Elsewhere, Kris Kristofferson and Brandi Carlile perform a somewhat ragged but heartfelt performance of "A Case of You;" Carlile impresses with one of Mitchell's most demanding songs, "Down To You;" James Taylor puts a jazzy spin on "River;" while Emmylou Harris performs the 1994 album cut from Turbulent Indigo called "The Magdalene Laundries." The song addresses the tragic treatment of "fallen women sentenced into dreamless drudgery" and features a beautiful blend of Greg Leisz on pedal steel (reprising his role from the original recording), Ambrose Akinmusire on trumpet, and Scarlet Rivera on violin. Norah Jones also takes on a track from Turbulent Indigo with "Borderline." In 1993, Joni told an audience what inspired the song: "We seem to be dividing amongst ourselves worse then ever, all over the globe. It seems that whenever possible, we draw a line of difference." Twenty-five years on, the song remains a reminder of the dangers of separation. Jones juxtaposes the heavy lyric with a syncopated shuffle while delivering a beautiful vocal performance. For his part, Graham Nash gets the crowd singing along with a solo piano version of his hit "Our House," written while he was living with Joni in a very, very, very fine Laurel Canyon home. Later, James Taylor performs a bluesy version of "Woodstock" that strips the song down to its earthy ethos while also highlighting Seal's heavenly backing vocals. Then, all the performers take the stage for a grand finale on "Big Yellow Taxi," one of Joni's most beloved songs. In all, the album does a fine job distilling some of the best tracks from those joyous concerts. What set Joni 75 apart as an event was the outpouring of respect from the performers (not to mention Joni's direct involvement in the concert). Nearly every artist who took the stage had long-lasting ties to Joni, had performed with her or had previously performed her songs. And the top-notch back-up band that anchors every performance also had deep ties to Mitchell. Led by drummer Brian Blade and pianist Jon Cowherd, the band also includes guitarists Greg Leisz and Marvin Sewell, trumpeter Ambrose Akinmusire, as well as Jeff Haynes on percussion, Chris Thomas on bass, Bob Sheppard on woodwinds, and special guest Scarlet Rivera on violin. With a wealth of musical talent and selections from across Joni's illustrious career, Joni 75: A Birthday Celebration is a fitting tribute to one of the legendary musicians of our time. There are enough inspired performances of hits, deep cuts, and other hidden gems to inspire even the most puristic Joni fan to pick up this tribute album. And if you want to supplement your album with some visuals, then you'll be happy to hear that a DVD of the concert is on the way, due to arrive on March 29. While details are scant at the moment, rumor has it that there may be some bonus footage and other special features included. As always, we'll keep you updated on that front. Also worth noting is the upcoming TV showing of the film, which will air in a slightly edited form on PBS's Great Performances in the first week of March. Check your local listings for air times. Don't miss your chance to secure your copy of Joni 75: A Birthday Celebration. You can find the CD track listing, as well as pre-order links for the album and the DVD below! DVD track listing and features TBD. This article has been viewed 1,154 times since being added on February 8, 2019.